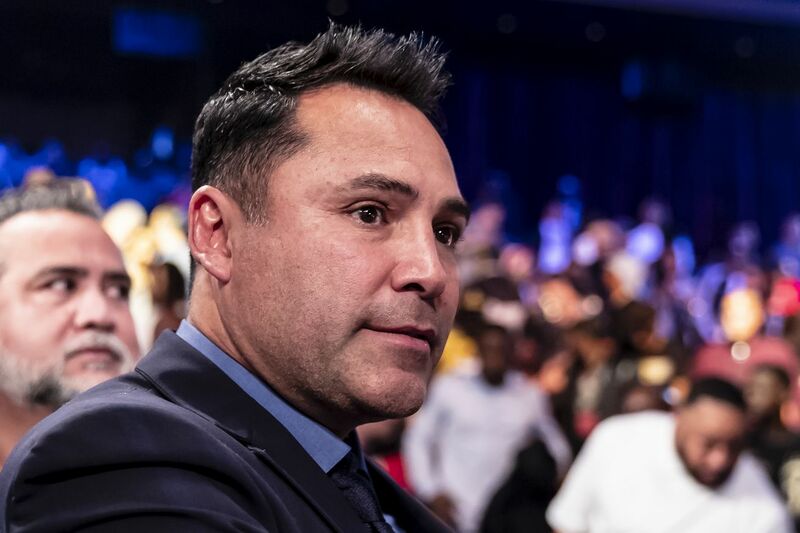 Get the Full StoryOscar De La Hoya claims that he personally put up cash to make the Canelo Alvarez vs. Triple G rematch happen. Oscar De La Hoya says outlandish things in the name of promotion. Most promoters do, but Oscar is a rare breed of ridiculous. Our latest DLH whopper quote comes in regards to the Canelo Alvarez vs. Gennady Golovkin rematch, which saw negotiations die a horrible death due to Triple G s ridiculous demands, only to be saved at the last possible second by Oscar s generosity. That s what he d like you to think, anyway. Here s the short version of the situation. Canelo and Golovkin fought last year, with a 70-30 purse cut in favor of Canelo. They went to a disputed draw, so a rematch was obvious. This time Golovkin agreed to a 65-35 split, and the fight was going to go down in May. But Canelo tested positive for clenbuterol and got suspended, which nixed the fight. Since then, De La Hoya and Triple G s promoter, Tom Loeffler, have been trying to iron out the details. Due to Canelo s positive tests, Golovkin s camp demanded a better cut than the 65-35 they took originally. There was a lot of back and forth, as usual. Finally, Oscar set a deadline - Golovkin needs to take a 57.5-42.5 split by noon PT on June 13th. That deadline passed with no deal. The fight was dead. Suddenly, hours after that, De La Hoya and Loeffler confirmed the fight was on for September. So what happened? Well, there are two sides of the story - Oscar s, and what the media is reporting. Those just happen to be very different things. ESPN s Dan Rafael reported that Golden Boy s chief Eric Gomez came up with a Hail Mary idea , while Oscar was actually on the phone with ESPN at the time, to make the fight - and Golovkin s side accepted it. Neither camp would go into detail about what went into it, but Rafael reported that executives from the MGM Grand, the host casino for the fight whose parent company owns T-Mobile Arena, got involved and came up with a tweak that helped get the deal done. Now we get to Oscar s side of things. And of course, he has a slightly different interpretation of events - namely, one that makes him look like the saint. That s exactly why I couldn t let this fight fall apart. I actually came out with my own money, to bridge the gap and make this fight happen. So hey, I m down a few dollars, but it s alright. Triple G wanted more, a bigger piece of the pie. It was a matter of a few million dollars. I couldn t get it from Canelo s side because he was going to stick to his guns about how much he s making. So I had to come up with the difference. And, for the fans - I did it for the fans. And for myself. I want to see this fight. Regardless of how it went down, the rematch is now scheduled for September 15th in the T-Mobile Arena in Las Vegas. And in between now and then, you can count on De La Hoya coming up with some more headline-worthy quotes along the way.